The plan is to take the Greyhound Bus from Charlotte, NC…to Gainsville, GA where my shuttle driver will pick me up and drive me to the trailhead. WhooHoo! 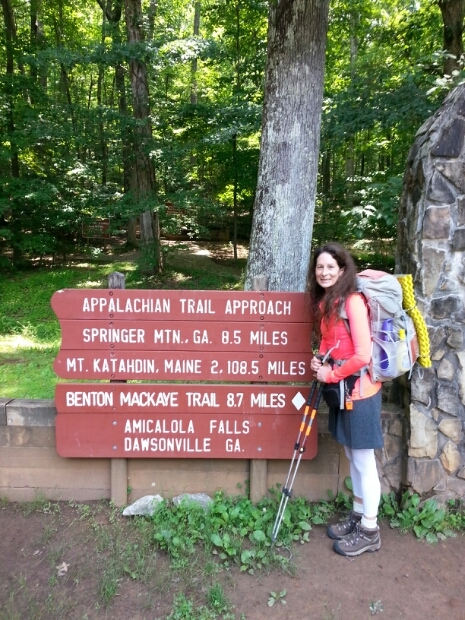 This hike begins in the Amicalola Falls State Park on the Approach Trail. This particular trail will lead me to Springer Mountain in Georgia which is the southern terminus of the Appalachian Trail. Within this park is the Amicalola Falls. These falls are the highest falls east of the Mississippi River and with 604 stair steps to get to the top…I will then be on my way northbound! In 8.8 miles I will reach the Appalachian Trail (AT) and in .02 of a mile I will finally reach the Benton MacKaye Trail. The Benton MacKaye Trail is approximately 292.00 miles through the wilderness of Georgia…Tennessee and North Carolina. It has a total of two shelters for the backpacker…takes you across many fords…and for the last section of 85 miles it climbs the mountains within the Great Smoky Mountain National Park. Once I reach the Great Smoky Mountains (GSMNP) I will be within this park for two weeks. Backcountry permits are necessary when you camp within the boundaries of the GSMNP and the park rangers must know on what dates and at what shelters/campsites I will be camping at. I have already taken care of this and have my permits in place. Once I finish the BMT…I will take a short trail over to the AT and head southbound for approximately 42.0 miles making my way to Clingmans Dome. Clingmans Dome is the western terminus of the Mountains to Sea Trail (MST) and this is where I begin the last section of this hike. The MST has a few trail options in which I can choose from as it crosses through the GSMNP…and the reason why I will be in the Smoky Mountains for two weeks…I choose the longest route! On this hike, I will climb some of North Carolinas highest mountains. Clingmans Dome, Mt Sterling, Mt Mitchell and will skirt along Grandfather Mountain. With approximately 1,500 black bear within the Smoky Mountains (that is 2 bear per square mile) I am bound to see a few and look forward to it! Lord willing, my hike will end on the coast of the Atlantic Ocean where I will summit some oh the highest sand dunes around! Packcover…Osprey Pack Cover for none! This is all for now…will be back soon.